No open-top Ford these day, nor Vauxhall. There is a tiny Smart fortwo cabrio for slim people and VW markets the Beetle Cabriolet at £20k plus. Citroen has introduced the DS3 Cabrio from £18,595 but while it claims to be a convertible, what it really offers is a very large sun roof. 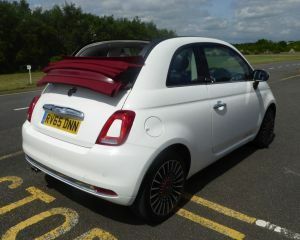 And there is the Fiat 500C with a basic price of £13,700. It is a proper drop-head, but not a sports car. It might be described as a sporty town car. One came the way of BTN during August, the colour described as Glam Coral, a sort of glossy orange, every piece of metalwork, both inside and out painted in that colour. At least in the dark you could not fail to spot it. It is truly a convertible, the roof controlled by two buttons and with three positions, either just the front open, a sort of half-way house, or fully depressed. It finally drops down at the rear, rather like the MINI, and, as with that car, restricting the view. No special hand locking is needed for the roof and 70 mph is easy on a motorway, even if it takes time to get there, with just about 100mph obtainable on certain Continental roads. Close on 60 mpg is available on a run. With a generally fine month, roofless cars were seen all over the place, some more antiquated than others but in every case the driver enjoying the sun beating down. And so it was with the Fiat, a genuine 2+2. The original Fiat 500 “Cinquecento” post-war economy car, launched in 1947, copied VW with a rear engine. After two years, this was swapped to the front. Many derivatives found their way into the showrooms over the years but in 1975 the line came to an end. The then-Fiat top brass thought the Fiat 500 too small. Rush forward 30 years and a new board had other ideas. Italy, and Europe, needed a new city car, something trendy and with sparkle. Launched in 2007, and built ever since in Poland, the 21st-century Fiat 500 has been a great success, a fashion icon not to everyone’s taste, but a trendsetter, and as, they say, “cool”. Some would not be seen in something with as bright paintwork as the 500, but others, particularly the younger element, clearly consider it "hip". There is room in the back for an underfed couple and the boot is ideal for handbags. The rear seats do fold down. To drive, the Fiat 500C feels like the city car it is. The suspension is soft, one should try and avoid roads with too many humps and it leans through bends. Forget the traffic light grand prix. With a five-speed manual (auto available) gearbox, 0-60 in just under 13 seconds is noisy but not very effective. The steering can best be described as vague and with its laid-back performance, it is not a townie sports car. All the controls come together nicely and the electric window buttons are in the centre, easy to find once you get used to the car. No need for power-driven folding door mirrors. The test car came with a four-cylinder 1.2 petrol engine including stop-start (that was quickly switched off). There is a semi-automatic version and the Twin Air, two-cylinder 1ltr version and also water cooled, presumably designed to meet engine-size regulations in certain counties. Our car did rev sweetly enough and delivers enough punch to satisfy in town and lower-speed driving. The box needs to be used if you want sprightly acceleration. You can also get an ‘Eco’ version of the 1.2 engine, whi h brings lower CO2 but costs quite a bit more to buy. The test car came with a fixed Tom Tom navigation system, best described as very adequate. The optional rear-parking sensors on the test car are essential for fulfilling duties as a town car and parking in tight spaces. The Fiat 500 is not for everyone. It has only two doors to start with and competes with some fine vehicles around the same size with access to the rear without disturbing the front -passengers. Where it comes into its own is the ‘C’ version and if it is fresh air you want, at this price range, there is really no competitor. It’s also aimed at the young. The editor-in-chief enjoyed his week of Polish/Italian motoring but it is perhaps not for him. With the Fiat, and worse most diesels I find them jerky and prone to cut out when coming to a forced halt. What's not to like about stop start technology? Rather than make a blanket statement it would be helpful if you explained what your issue was! "Citroen has introduced the DS3 Cabrio from £18,595 but while it claims to be a convertible, what it really offers is a very large sun roof." To my eye, the Fiat has exactly the same form as the DS3 - e.g. a large sunroof. The driver is still surrounded by glass, six pillars etc. etc. Secondhand Golf or A3 cabrio anyone?